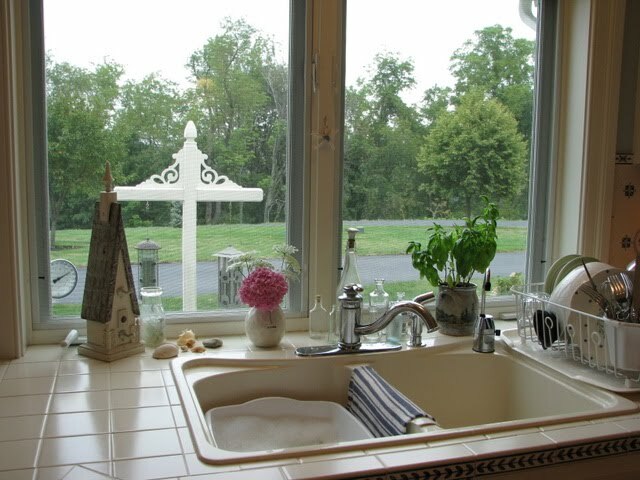 A common kitchen sink. What could be memorable about that? It’s just a functional part of all of our homes. Mine’s not beautiful or special. It’s not made of the latest high tech material. It’s just a plain old kitchen sink that has ten years’ worth of nicks and scratches. I've been spending a lot more time there than usual, since my dishwasher has been broken for the past week, and I'm washing all the dishes by hand these days. Today I looked around and noticed how I’ve made this area of my home a spot that’s filled with things that are meaningful to me. Maybe that’s why I don’t really mind spending time there. I thought you might enjoy seeing some of the things in this everyday workspace that make it uniquely mine. 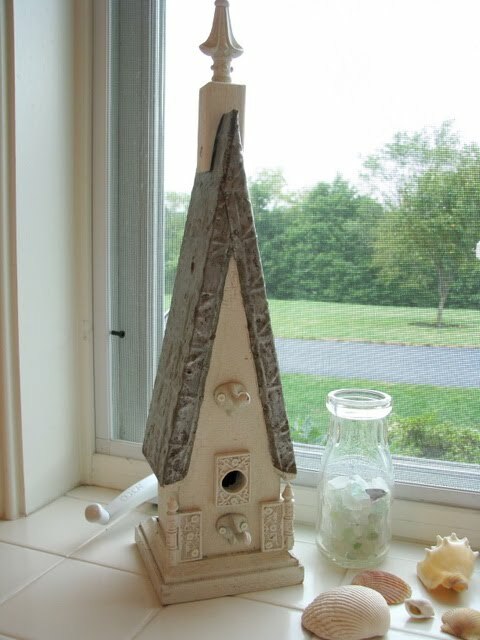 I bought this shabby chic birdhouse at my favorite flea market. It serves no purpose other than to make me happy. I just think it’s kind of cool. I especially like the old tin ceiling pieces that are used for the roof, and it reminds me of the hours I’ve enjoyed roaming the aisles at the flea market, looking for treasures. Half of my house is furnished with things I’ve found there! 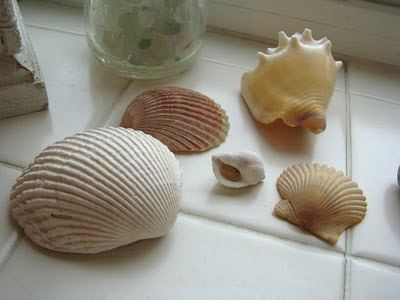 The shells are from the beach where we vacation in North Carolina. 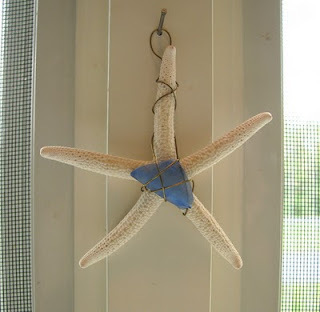 They remind me of baking-hot summer days, of glaring sunshine and cool water, of crashing waves and screeching sea gulls. I remember early morning walks with Fred at low tide, and sunset walks with the whole family, trying to squeeze every minute of fun out of our too few days at the ocean. Outside my window, I watch the birds at the feeders hanging from a post that Fred made for me. 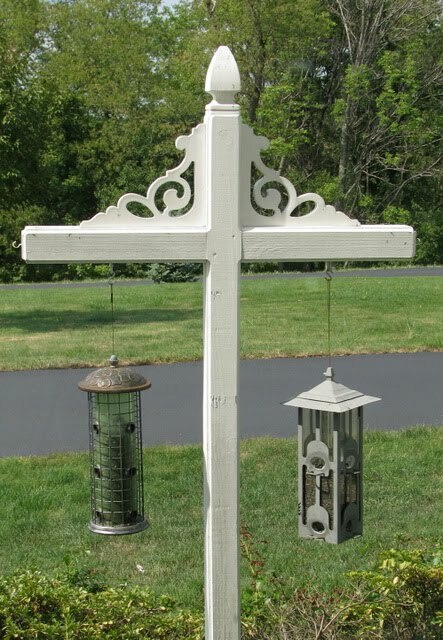 All throughout the year, the sparrows, cardinals, and finches jostle for sunflower seeds and swoop and dive and put on a show for me. 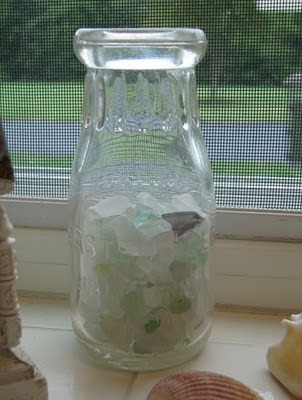 This old milk bottle was from an antique store in West Virginia. Fred and I picked it up on a camping trip years ago, and it makes me think of that relaxing weekend, when we took the time to just wander around and spend time together. It also makes me think we need to do that more often. The bottle is filled with sea glass that I gathered on Cooper’s Beach, near Rockland, Maine, two summers ago when we rented a cottage for the whole family. 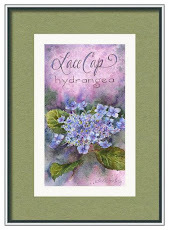 It brings back memories of fog horns, loons, rocky beaches and fields of lupines. 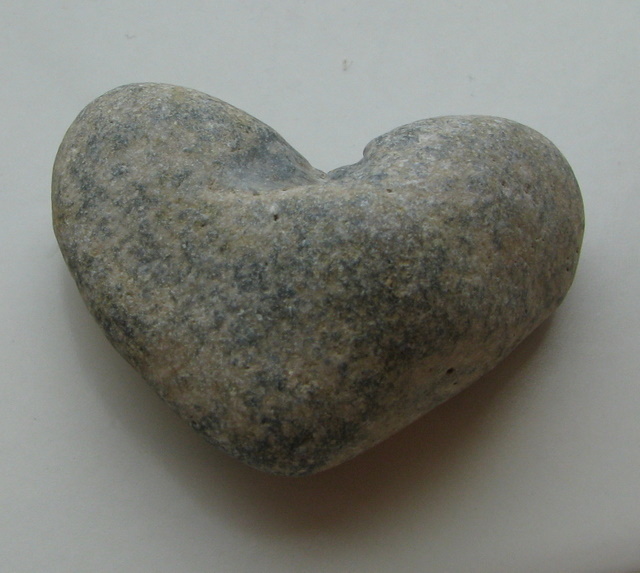 It makes me vow to return to Maine …soon! I have a collection of heart-shaped rocks from all over the country. I search for them when we travel, wherever there is a stream, creek, river, or ocean. This one is from the Pedernales River near Austin, Texas. My daughter brought it back for me when she went to visit her fiance’s family for the first time, last Thanksgiving. I love having a bouquet of flowers by my sink. They brighten my day and make me smile. 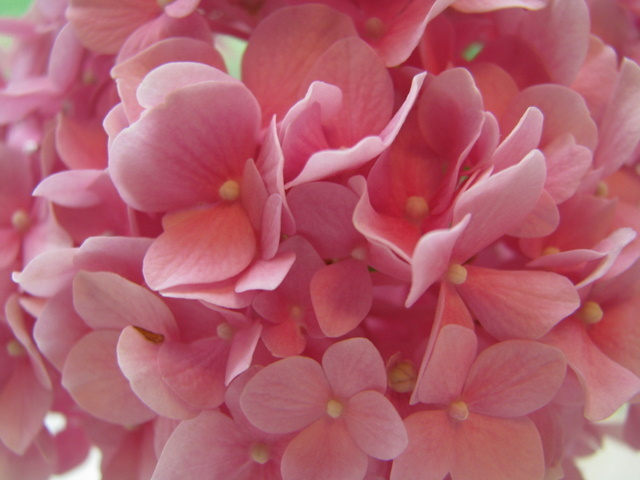 These pink hydrangeas are from my yard and are one of my favorites. 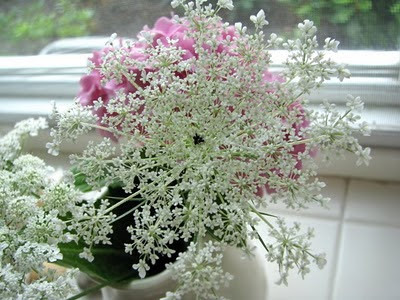 The Queen Anne’s Lace grows in the fields surrounding our home. 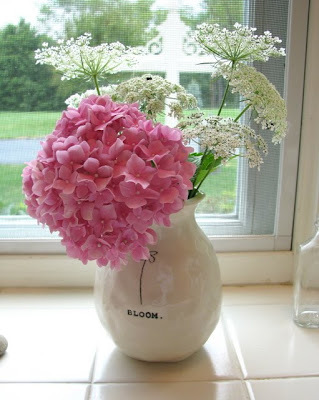 The “bloom” vase is from Vail, Colorado, where Fred and I visited last fall with our good friends, Betty and Paul, from Texas. It’s a great reminder of a beautiful place and good times with lifelong friends. 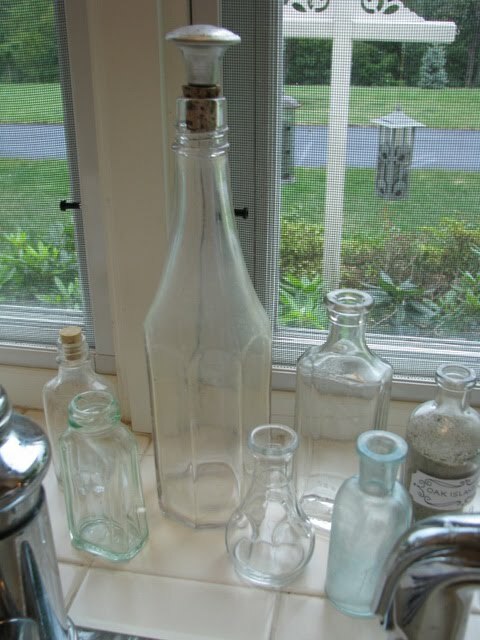 Fred and I collected these bottles on our vacation to Oak Island this month. 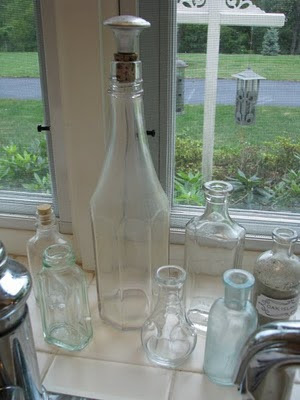 We spent a fun afternoon in Southport, North Carolina, browsing the antique shops to find containers for my new sand collection. Yes, you heard me right - I’m going to collect sand. I want to have a bottle full from all the beaches I visit. 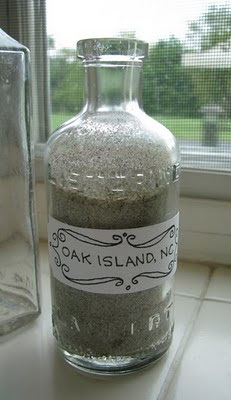 So far, I only have Oak Island, but this gives me a great excuse to go to lots and lots of beaches, to add to my collection. 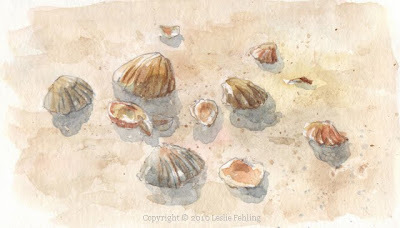 I just wish I could get samples from all the beaches I’ve visited in the last 30 years – I’d have quite a collection! The largest bottle in this group has been in the family for years and years. 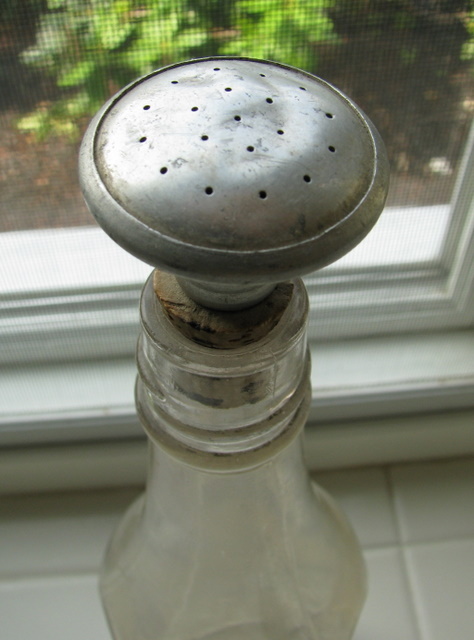 It was my grandmother’s laundry sprinkling bottle, made from a ketchup bottle and a cork stopper with an aluminum sprinkling top. My inheritance from Gramma Romaine! 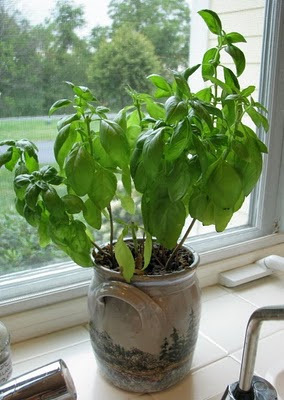 I often grow rosemary and basil on my window sill. The basil plants last a couple of months, then usually die off, but the rosemary can last for years, if I treat it right. This basil plant is growing in a pot that I made when I took a pottery class with my son Matt when he was in high school. It was a nice thing for us to do together, but his skills quickly surpassed mine. This pot is about as good as I ever got – I did a Maine coastal scene in the underglaze, so it reminds me of one of my favorite places, and of good times with Matt. 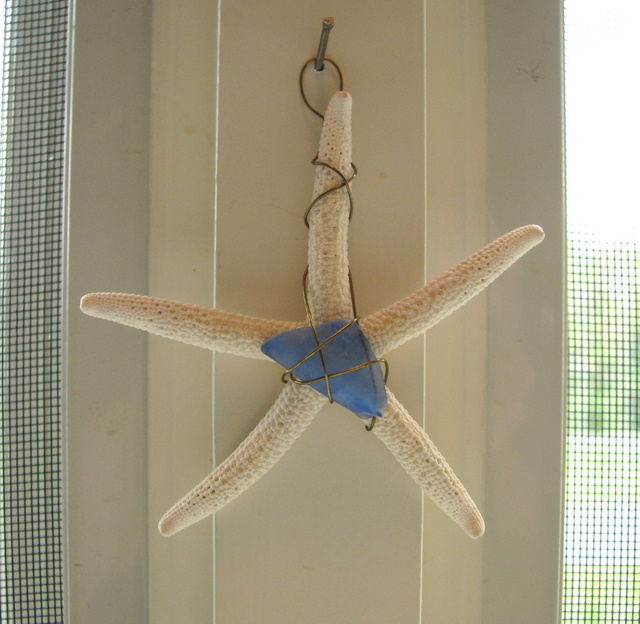 I got this little starfish/sea glass ornament when my mom and I spent two weeks in mid-coast Maine last summer. It’s a memento of a really special time together. I put all these doodads around my kitchen sink for the same reasons we put family photos on the refrigerator. It connects me to the people I love and to memories of happy times, and it helps me to focus on what’s good in my life. 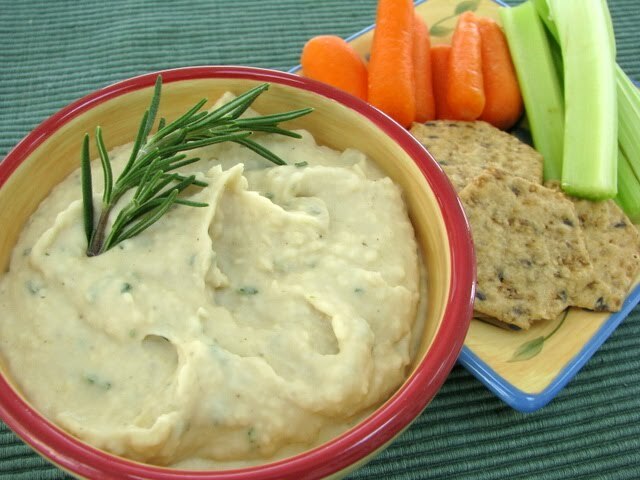 Drain artichoke quarters, reserving ½ cup liquid. Stir together rice, artichokes, chicken, and next 4 ingredients. Stir together artichoke liquid, mayonnaise, and curry powder. Toss with rice mixture. Cover and chill 8 hours. Serve on leaf lettuce. 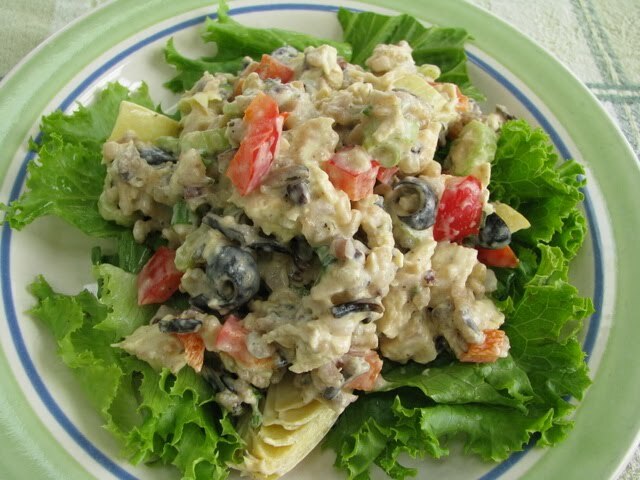 Recipe notes: This recipe makes a lot of salad. I half it unless I have plenty of hungry people to help me eat it. I sometimes substitute Miracle Whip for mayonnaise, or use half of each, just to cut the calories a bit. To make the recipe gluten free, I eliminate the long grain and wild rice mix because, in all the brands I've checked, the seasoning packets contain gluten. As a substitute, I cook a plain (gluten free) long grain and wild rice mixture, adding my own seasoning to the cooking water. I throw in some salt and pepper, parsley, and a smattering of other herbs. I had company over the weekend - aunts and grammas and cousins, all in town for my daughter's bridal shower. 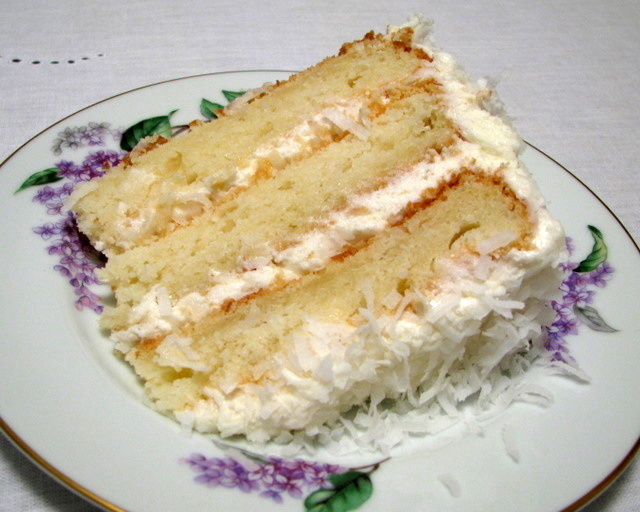 I made a great dinner Friday evening and, for dessert, I served this wonderful coconut cake. The recipe originally came from my aunt, Marie Staley, and I often make it for my Summerhill Weekend Sewing Retreats. It's great for a special occasion. I've never met anyone who didn't absolutely swoon over it! Cream butter or margarine and sugar until light and fluffy. Blend in sour cream and vanilla. Add combined dry ingredients alternately with milk, mixing well after each addition. Stir in 3/4 c. coconut. Fold in stiffly beaten egg whites. Pour into three greased and floured 9” layer cake pans. Bake at 350º for 30-35 minutes. Cool 10 minutes and remove from pans. 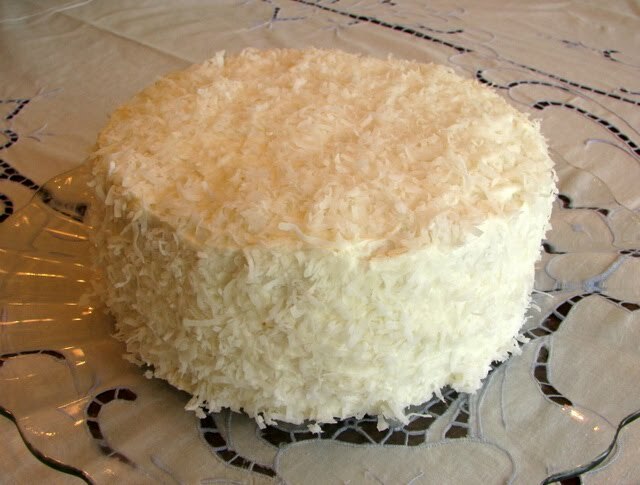 Fill and frost with Fluffy Vanilla Frosting, sprinkling coconut on top of the frosting between the layers, and on the top and sides of the frosted cake. Cream butter. Blend in vanilla and salt. Add sugar alternately with egg white and milk, beating until light and fluffy. May tint coconut, if desired. We had a bridal shower for my daughter Sara yesterday at a wonderful tea room in our area - the Johnston House, in Mars, PA. I was really looking forward to giving her the gift that I've been working on for several weeks. 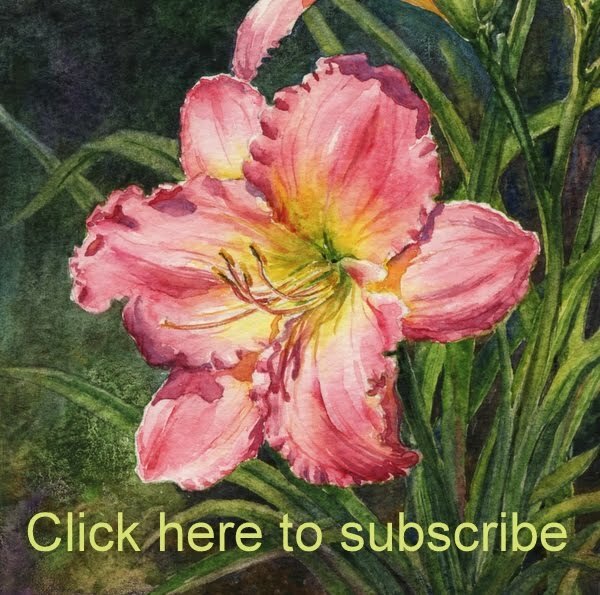 There had been a few close calls where she had walked into my workroom while I was sewing, and I scrambled to cover up the project while shouting, "Close your eyes! 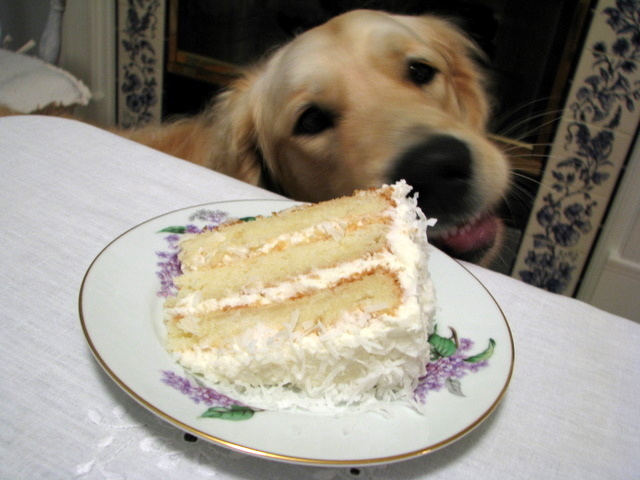 Don't look!!" 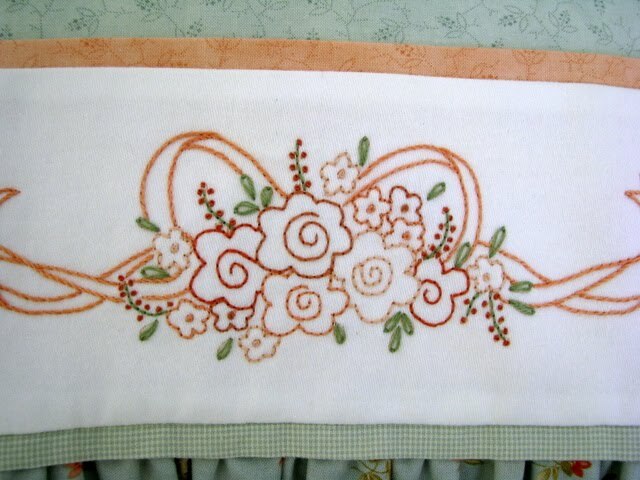 But the big day finally arrived when I could give her the embroidered sheet set that I had been making for her. It turned out so pretty! The pillowcases were hand embroidered with a forget-me-not design. The embroidered band was set off with a folded contrast band of fabric on each side and a sweet floral ruffle. I love doing hand embroidery. 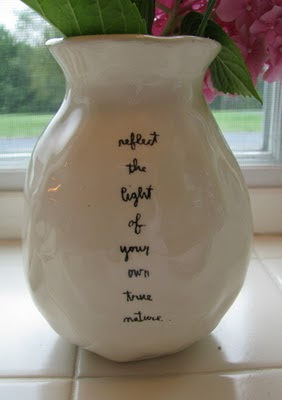 It's so easy and relaxing and doesn't take too long to finish a project. 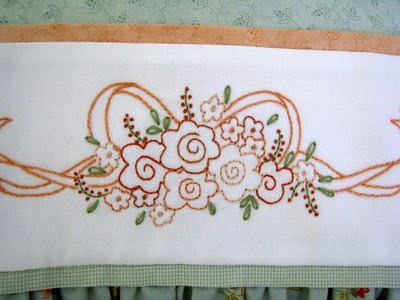 These pillowcases were done with backstitch, French knots, and stem stitch, and I used DMC floss. 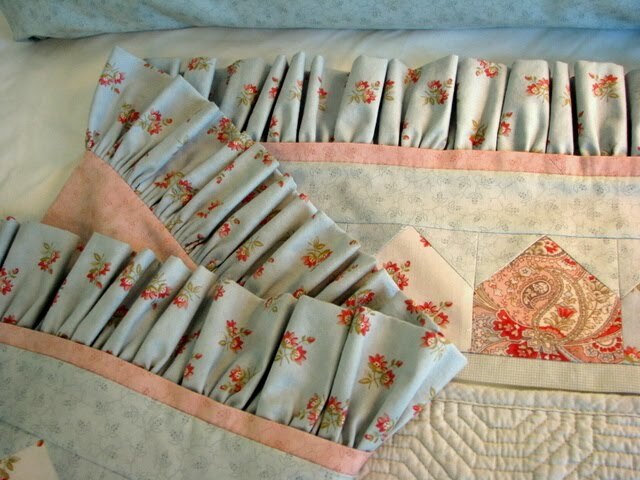 The flat sheet was given a pretty patchwork border, contrast banding, and a floral ruffle. 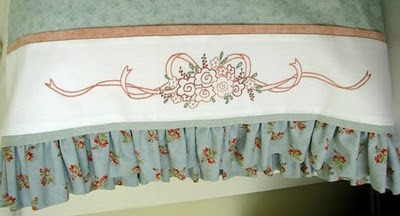 The fabrics for this project were mostly from Moda. 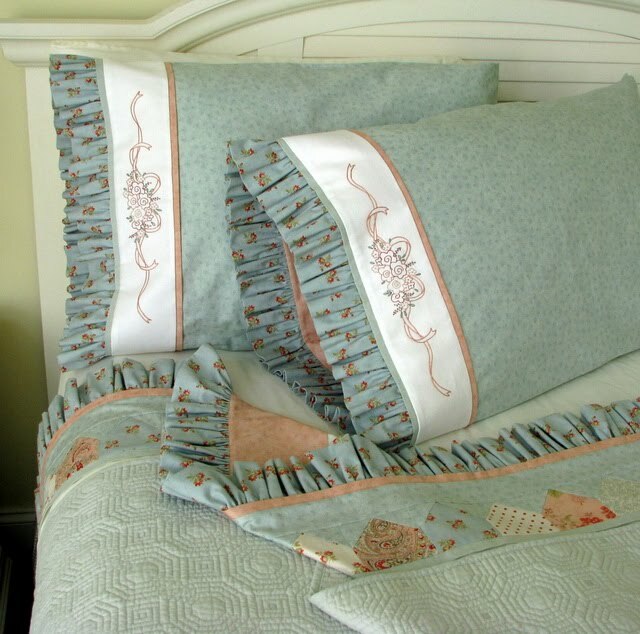 The Forget-Me-Not Bedding Set by Crabapple Hill Studio that I used had great directions and was very easy to follow. Take a look at their website. 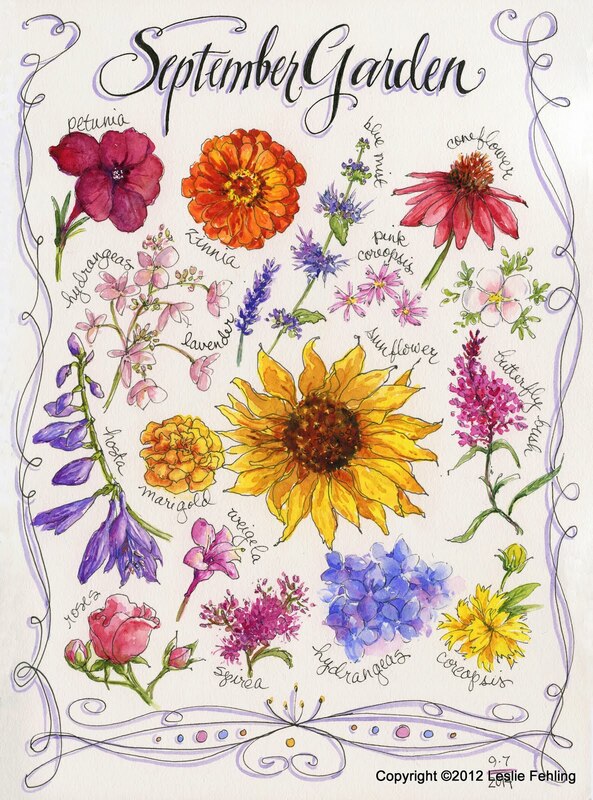 There are 16 pages of embroidery and quilt patterns, and they're all so cute! I think I may order another pattern and get started on a project for myself. Sara loved her gift and thought the sheets and pillowcases were really beautiful. The only trouble is, they're almost too pretty to use! 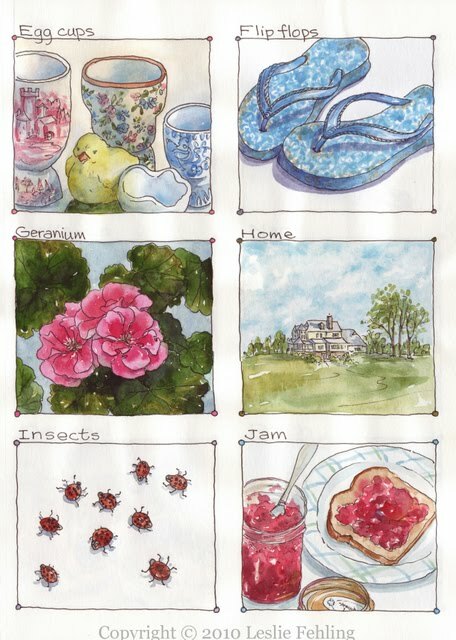 While we were in North Carolina last week, we enjoyed lots of fresh, local summer fruits. The peaches were heavenly, and I loved them so much that I brought a basketful back home with me. 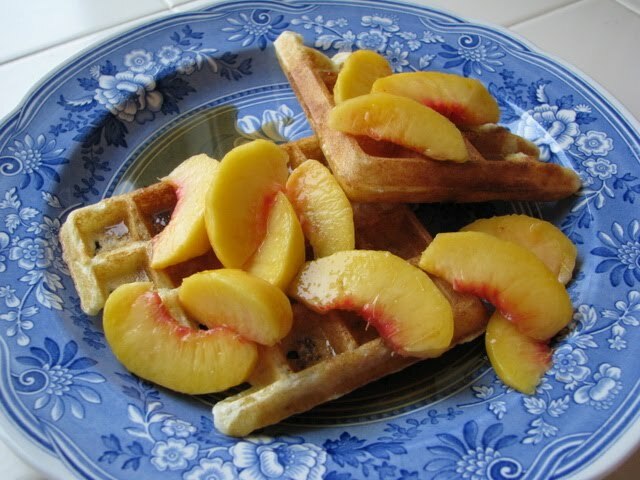 This morning I decided to whip up a batch of my Easy Buttermilk Waffles to enjoy with the fresh peaches. Good decision! Breakfast doesn't get any better than this! There are two things I really like about this recipe, besides that fact that the waffles taste WONDERUL - it uses less oil than most traditional waffle recipes do, and you don't have to beat the egg whites and fold them into the batter, which takes extra time and uses more utensils. It only takes about 5 or 6 minutes to make the batter. Then just plop about a half cupful onto the waffle iron, and get ready to enjoy delicious, light, crispy, tender homemade waffles. I like them with maple syrup and fresh fruit. Add the wet ingredients to the dry and whisk together until thoroughly combined. Ladle the batter onto the preheated waffle iron. Cook until golden and crisp. Serve with maple syrup and/or fresh fruit. Waffles may be frozen, to be thawed and toasted at a later time. We made our annual pilgrimage to the beach last week, and it was a much needed break from the everyday busyness that's the norm for me. We rented a big, beautiful house just across the street from the beach on Oak Island, NC. The whole gang was there - my sister and her family, my daughter and her fiance, my mother, and Fred and I. Even Buckley and Daisy, the family golden retrievers, came along! Only our son Matt, who lives in Colorado, was missing. 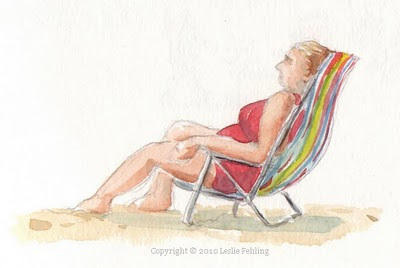 Sketching at the beach is challenging, to say the least. 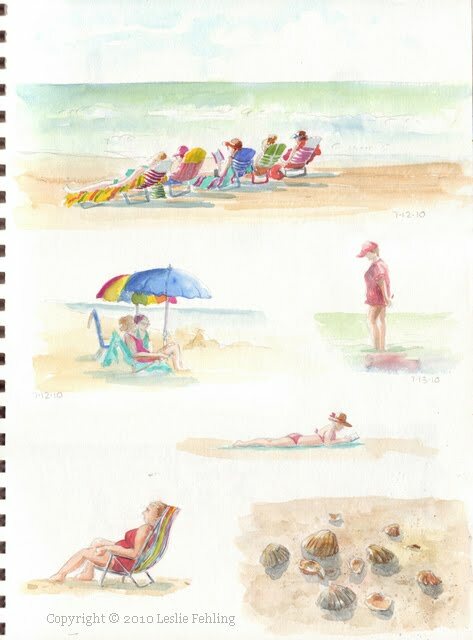 Bright, intense sunshine, high winds, and salt spray all make for less than ideal conditions, but I was determined to practice drawing people, and what better place to do it than at the beach? It's like having a life drawing class going on all day long! 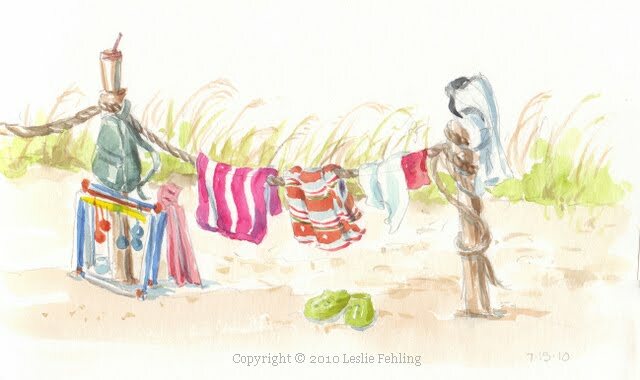 Beach umbrellas, with their bright, cheery primary colors, are a lot of fun to paint, too, along with the soft, tropical colors of the beach houses. 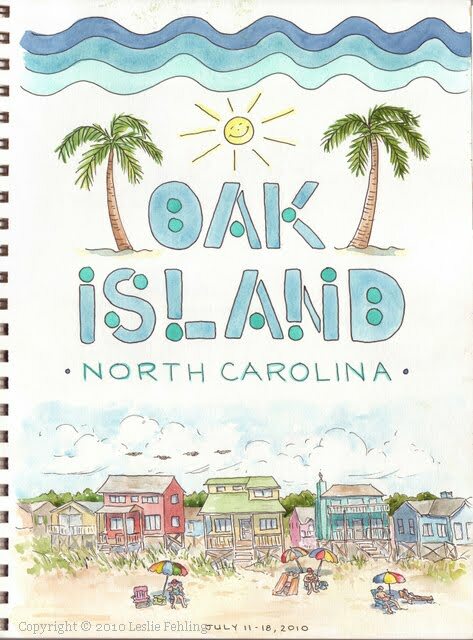 Oak Island is about a half hour south of Wilmington, NC, and we really enjoy the clean, uncrowded beaches and family atmosphere. No boardwalks or ferris wheels here, just the waves rolling in on long stretches of sandy beaches, and lots of time to do nothing. 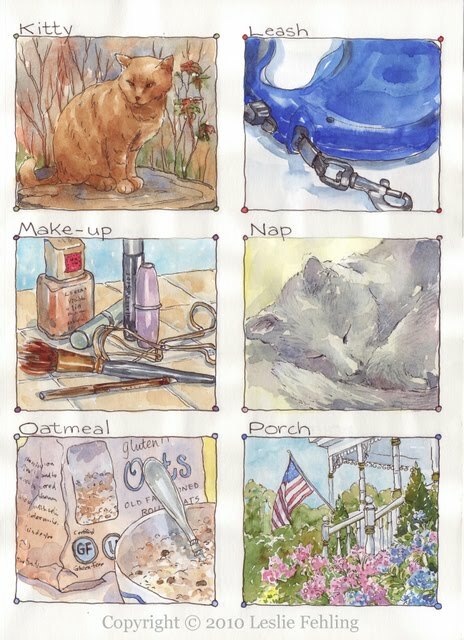 Here's a shot of the full page in my 8 1/2" x 12" sketchbook, to give you an idea of the size of the individual paintings. I decided to work small to save time and keep detail to a minimum. These ladies spent hours every day doing what they loved best, soaking up the sun and reading a good book. I loved how they looked, all lined up in a row. My models didn't know they were posing for me, so I had to work quickly to capture the scene before someone decided to take a walk or go for a swim. The water was wonderfully clear and warm all week long. Just perfect! I'd love to know what books everyone was reading! I plowed through three good novels in the week I was there. At home, it takes me forever to get through a book, since I only have time to read for a half hour or so before I fall asleep at night. I think it's more fun to draw and paint people who aren't classically beautiful. The lumps and bumps and imperfections usually make for a more interesting sketch. This one might be my favorite of the sketches I did last week. This little 4 1/2" x 7 1/2" sketch shows a westward view of the beach at Oak Island. I painted this sketch on the last evening we were there, right around sunset, enjoying the feeling of the sand, the waves, the wind, and the sunshine all around me. That last day at the beach always seems bittersweet to me - it's been a wonderful time to relax and rejuvenate, but I know that I probably won't see the ocean again for a whole year. That's just the way life is, I guess. 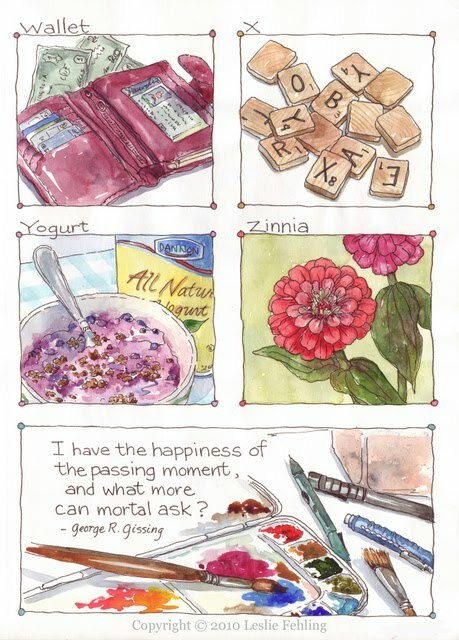 We have to seize those happy moments when we can and appreciate them, not bemoan the fact that they don't come every day. But those hours and days I spend at the beach are so special to me.The ocean restores my spirit and speaks to my soul like nothing else can. 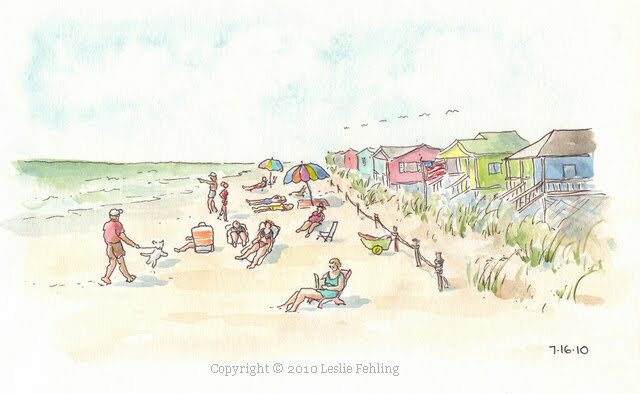 We're heading for the beach tomorrow, and I can hardly wait! Sometimes I think that's the only place I ever really and truly relax. 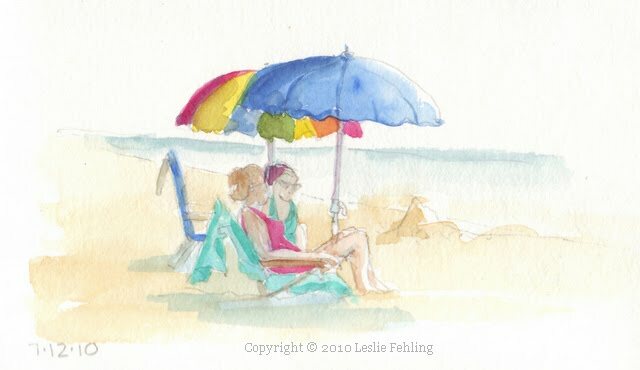 Sitting under a beach umbrella, reading a good book and watching the waves roll in - that's my idea of the perfect day. I"m looking forward to seven of them this week. Yippeee! It's an 11-12 hour drive from Prosperity, PA, to Oak Island, NC, and, since I'm not a fast food fan, we usually pack a cooler with food to eat on the trip. My mom and I made some yummy curried chicken salad to have for lunch, and I whipped up this delicious Rosemary Bean Dip to eat with vegetables, chips, or crackers when the munchies strike. I know bean dip may not sound all that thrilling, but trust me, this is really good, and it's healthy, too. I love the combination of flavors - olive oil, fresh rosemary, a hint of garlic, and the tang of fresh lemon. And it only takes about 5 minutes to throw everything in the food processor and puree it. It's important to use fresh rosemary. Dry is not a good substitute - it just doesn't have the same intense fresh flavor. And fresh lemon juice is best, but I've used bottled in a pinch. Puree all ingredients in a food processor until smooth. Pour into a serving bowl, and lightly drizzle with olive oil. Serve with sliced baguette, tortillas chips, crackers, or crudités. 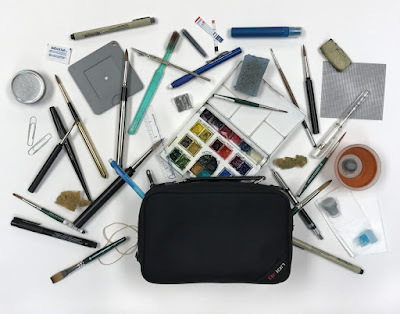 Sometimes it's really hard to find time for our own creative pursuits. It's a daily struggle for me. I may call myself an everyday artist, but very often the art that I'm producing is for my clients, not for myself. It's so easy to let my obligations to others crowd out the joy that comes from doing something I really love to do. But I've realized that it's up to me to take the time that I need. It's a choice on my part. I'm not a victim. No one is holding a gun to my head and saying, "No, you can't sketch! You must make a slipcover!" I've discovered that it's easier for me to justify taking small chunks of time for myself than to wait and "save up" for a whole day of painting or sewing or whatever it is that I want to do just for me. That's why I don't do a lot of larger finished paintings - it's much easier to fit in 15 minutes of sketching than to commit hours of time to a 20" x 30" painting. This alphabet is great example of how those little 15 minute chunks can add up to something substantial. 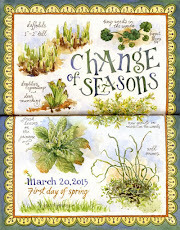 I painted the title and laid out the squares in March 2009 and added to it over the course of the next 10 months. Some days I only had time to do one little line drawing, then it would take me days and days to get back to it and add some color. Once in awhile I'd get on a roll and finish a couple of squares in an afternoon. Little by little, the blocks got filled in. 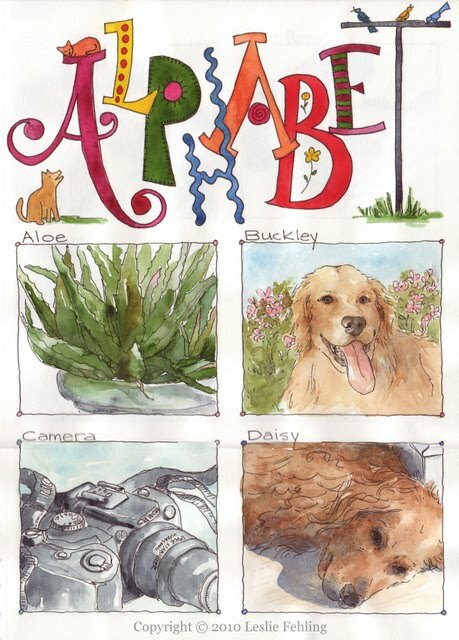 It was so much fun finding things around the house that I could use to illustrate the letters of the alphabet. 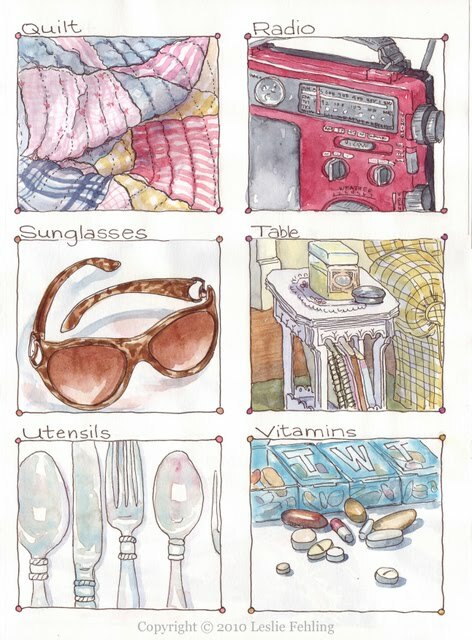 I have my own favorites - which ones do you like best?